With a cast of 75 dancers and 8 musicians performing 600 shows globally each year, we are among the largest and highest-booked of any Hawaiian Entertainment company in the world. 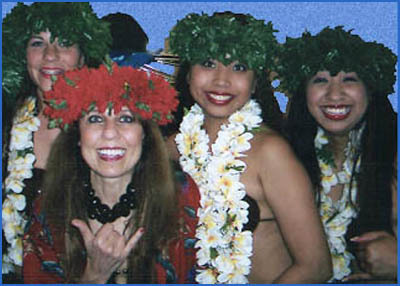 In the Chicago region, the Barefoot Hawaiian performs more luau, Hawaiian, and Polynesian shows than all other entertainment companies combined..
With 45 years experience and a reputation recognized world-wide, we strive in showmanship, performance, professionalism, and service to be second to no other in the Hawaiian entertainment industry. More information about our expert service and performers are provided on the rest of this page. We are ready to hear from you. 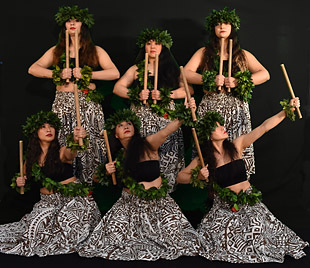 25 Professional Hula Dancers, 25 Professional Tahitian Dancers, and a team of Professional Samoan Fire-Knife Dancers is just a sampling of the talent in our Performing Arts Company. We perform all the various forms of Polynesian, Hawaiian, and Tahitian dance as well as the specialty dances of neighboring islands. Our 10-member team of girls that perform the mystifying Maori Poi Balls of New Zealand, is just one other example. Every one of our professionals is trained to perform from solo to a member of a full cast show. No show is too big or too small. And that covers only our all-professional team. Available for most public shows are another 50 dancers that comprise our cast of non-professionals. These include 20 adult females (Mohala) and 30 children (Keiki) ranging in age from 3 to 15 years. These up-and-coming stars of next generation professionals are nothing less than entertaining. For 35 years, the Barefoot Hawaiian has had its own band. Today our band is a of musicians multi-talented in both instrumentation and vocals. For the fast pace Oteas of Tahiti our Tahitian drum team provides the accompaniment for our dancers. We have been performing Tahitian drums for the same 35 years, and we teach the technique in our own school. Our musicians do not require a stationary stage or platform or even need to be near a source of electricity. We have performed in many parades on floats where we provide our mobile electronic equipment and electricity. Wherever you are having the party, our musicians can be there too. Smaller performances are done to CD music, and whether your show is small or large, we provide all our own equipment as needed. This includes quality systems, speakers, and electronics. 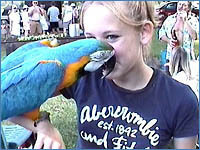 Scottie, Chicago's most loveable parrot, can provide the most interactive part of any show. His job is to mingle with guests, put smiles on their faces, and create those photographic moments and memories that last a lifetime. 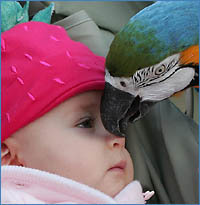 Scottie the Parrot TM is a third-party option for any Barefoot Hawaiian show. Click here for more information. 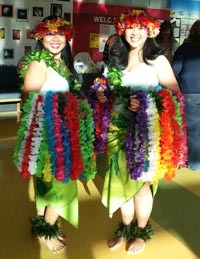 Our lei greeters provide early interaction by welcoming your guests and getting them into the Hawaiian mood the moment they arrive. 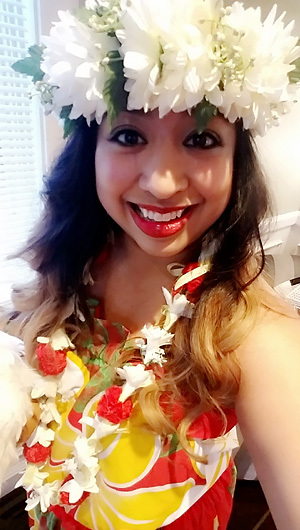 Then during the show, guests of honor, your staff, or willing volunteers are invited to join us on stage for a quick hula lesson and to show all the rest that fun and laughter truly is the best medicine. It is important to us that you do more than watch a show; for it's a better one when your guests participate in it. With scores of professional performers expert in the Hawaiian dance arts, a band, a drum team, solo musician, tropical parrot, and lei greeters, one may wonder what else can there be. Well, there is much more. We have more added-value items, options, and extras than we can list. We have our own show emcee, who not only runs the show but explains some history and trivia associated with the various performances. As for performance variety, we refuse to be second to anyone. In costuming alone, our performers may make as many as 7 costume changes in just one show. Nearly all costumes are custom made by hand to traditional styles. In addition to modern traditional Hawaiian and Tahitian costuming, we also honor, upon request, specific costuming requirements all the way to ultra-conservative with minimal skin exposure. Our performance will be equally like-minded. The Barefoot Hawaiian, respects the traditions of all cultures, beliefs, societies, age groups, and settings. How about a New Zealand Warrior with full face-paint and garment greeting your guests with the traditional New Zealand warrior welcome? We have him too. When needed, we have our own area and spot-lighting. Our performers are never in the dark such that you can't see them. Go first-rate with real flower leis flown in fresh from Hawaii. We can also equip your entire staff or luau hosting team with matching Aloha shirts from Hawaii in the sizes you need. What many consider special requests, we do routinely. From Harpo Studios right here in Chicago to the Government of China for a show in Shanghai, the Barefoot Hawaiian has been selected by and performed for more fortune 500 companies, global corporations, and international organizations than any other Hawaiian Performing Arts company in the Midwest. We have performed for half-time shows in sporting events, televised parades, and state fairs. 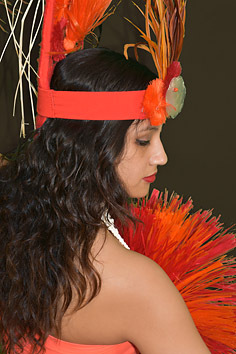 Our dancers have been the selected dance performers for top Hawaiian musical artists. The Barefoot Hawaiian has had uncounted television appearances and interviews and has been photographed for and written about in countless newspaper articles. 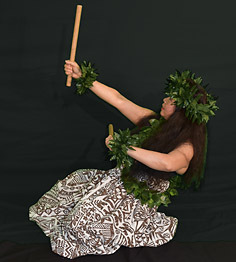 Barefoot Hawaiian performers have competed in televised dance contests and world competitions. We have world-placing champions and titlists in our cast. You receive the same performance that earned this reputation. First-rate is not optional. 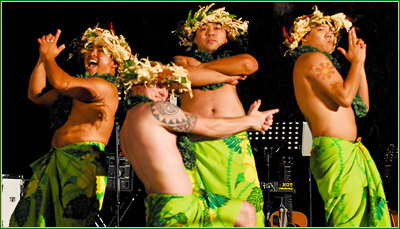 We are committed to providing you the best value in luau, Hawaiian, and Polynesian entertainment. When you consider our years in business, experience, professionalism, variety, extras, and options, you receive the most for your money from a Barefoot Hawaiian show. That value goes beyond a first-rate performance. Everyone who orders entertainment from us, also receives a 25% discount for merchandise in our Hawaiian Shop. Buy your aloha shirts, múumúus, grass skirts, lies, etc. and save even more. We are also fully insured, and although we have never faced a single claim, you can rest easy that you and your guests are covered in the event of an unforeseen circumstance. With everything we offer, you also save time. In the final analysis, it all must work and work well together; otherwise, it will appear as a bunch of individual dancers simply thrown together. To ensure your total satisfaction with the entire performance, Barefoot Hawaiian shows are carefully scripted, directed. and produced, just as you would expect in any fine entertainment. Each performance and act in the show is a choreographed dance routine synchronized to carefully selected and performed music. Our dance company is comprised of not just dancers, but dance teams, leaders, team directors, and choreographers. Nothing is left to chance when we take the stage. Moreover, to keep the variety fresh, we completely redo the production every year for our general performance shows. Each year receives new dance routines, new choreography, new production numbers, and new music (except for retaining the highly requested favorites). In short, it's a new show every year. "ALOHA! The Beat Goes On..."
"Polynesion Fusion ~ Shifting Tides"
"Waves, Flowers, and Fires of Polynesia"
"Voyage Through the South Pacific"
"Islands in Time  25 Years of Aloha"
"Rhapsodies of the South Pacific"
"Love is Reflected in Love"
Then, to offer you even more variety, we have specialty shows such as our restaurant and lounge performance offerings that are available to restaurants, lounges, nightclubs, and other similar venues. Need something special? We can customize a show specific to your needs for your establishment. Call us today for more information. Finally, we offer other specialty show packages such as our famous Klub Kane Revue, a dignified and respectable all-male performance that is certain to thrill. Learn more about this show on our Seasonal and Packages page. Our goal is the achievement of perfection, our creed is to remain true to the arts, and our promise to you is one of dignity and professionalism. Only our Professional Division dancers perform the private shows. Each is a top-flight dancer and performer. Many of them are in our competition team, which competes each year against other professionals from around the world at the Tahiti Fete World Competition in San Jose and at the World Fire-Knife Competition in Oahu, HI. Every one of the professionals must maintain a highly rigorous and demanding training schedule, not only to maintain their certification as a Barefoot Hawaiian professional performer, but to improve their skills as well. And because we have our own school, we are certain that they do just that. They are not just dancers, they are athletes. In addition, you will always be guaranteed a totally dignified performance. At no point will any of our performers ever reduce themselves to something less by a cheap or sleazy gimmick in their routine. In fact, these are one of the few requests we must deny. So whether we are performing for your church social or for your bachelor or bachelorette party, you will be assured a dignified and totally professional performance of true and authentic artistry. Even with a reputation that spans oceans, the Barefoot Hawaiian remains a modest, family-owned business that places customer service first. We cater to your needs and do the show you desire. Want high energy? Nostalgic? Relaxed and easy? Tell us. Have a special occasion such as an anniversary requiring a performance or dedication to a very significant song? Consider it done. With more than 40 years in entertainment, we have experience with just about every request imaginable. You will not simply hear a "yes" from us, but can relax in knowing that the result will be as you dreamed it would be. 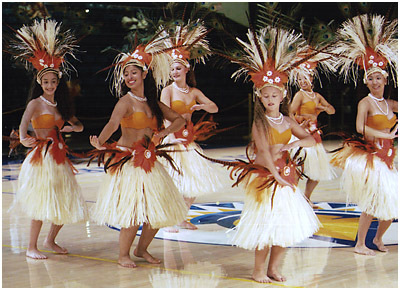 So whether you want one hula-girl to perform for your backyard luau or need a full-cast Polynesian show to entertain a hundred-thousand visitors to your state fair, you will always receive world-class professionalism with the highest in personalized service and attention. It all comes with a smile. Photography Policy | Spam Alert | ©2005-2018 by The Barefoot Hawaiian, Inc.
'Barefoot Hawaiian' is a registered trademark of and all logos shown are service marks of The Barefoot Hawaiian, Inc.